Recently refurbished 3 bedroom private pool house within the quiet and well-kept village of Baan Sanmanee in Bang Saray, Sattahip. Open plan lounge area on the ground floor leading to large European kitchen with all appliances including dishwasher and granite work surfaces. Upstairs there are 3 good size bedrooms and three bathrooms throughout. The master bedroom has a lovely balcony which has country views across to the nearby lake. 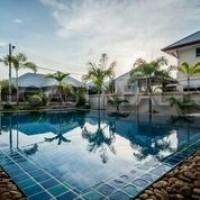 There is a large garden area with private swimming pool and covered parking. There is an outdoor shower area next to the swimming pool. The whole outside space is very easy to keep and low maintenance.